The volcanic activity at the ocean mid-ridges was at its peak. The carbon dioxide content of the atmosphere was about 4 times and the mean temperatures about 5oC higher than current levels. 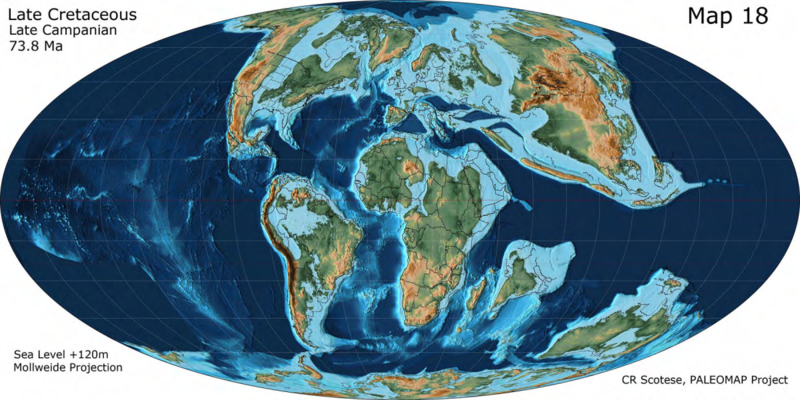 The ocean surface was 200-300 meters higher than what it is now, and Europe was largely – with the exception of the Scandinavia – covered by the sea. Many of the limestone deposits, such as the white cliffs of Dover in the south coast of England, were formed at this time, as a consequence of the sedimentation of calciferous Haptophyte algae to the bottom of shallow seas. The cretaceous period has got its name by these “cretaceous” deposits. The chalks used for drawing on black boards are pieces of these rocks. On the dry land, dinosaurs were diverse. 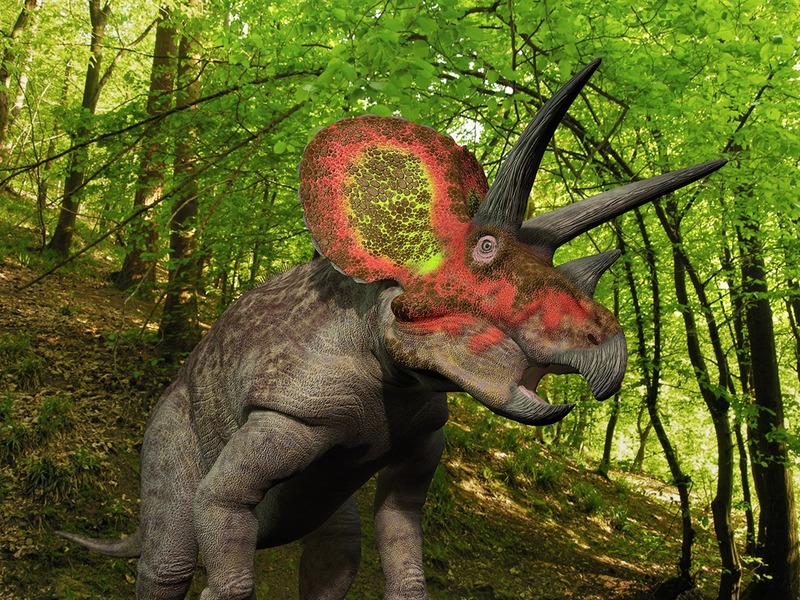 The most famous dinosaurs of the late Cretaceous period are 8-9 meter high tree-horned Triceratops horridus, different duck-billed dinosaurs, and the most famous predator dinosaur, Tyrannosaurus rex from Northern American continent. 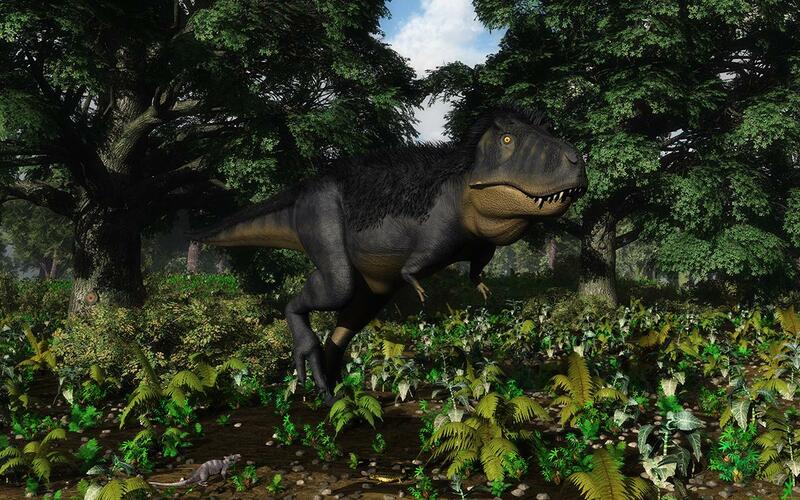 Tyrannosaurus growed up to 12 meters long, and weighted 4,5-6,8 tons. It apparently was both a vicious beast and a carrion-eater. Also one of the largest pterosaurs, Quetzalcoatlus, lived at the end of Cretaceous period. It had wingspan up to 11 meters. Also insects were diverse. Flora was diversifying and ’flowering plants’ or Angiosperms increased by 30 new genera. Still, grassy plants have not appeared yet, and so there are no savannah or plain types of ecosystems as yet.